When you buy a 1/2 oz 1983 Chinese gold panda from our shop today, you’ll enjoy the best price available online. These .999 fine gold 1/2 oz bullion coins come under seal from the People’s Bank Of China. Unlike most gold bullion coin series, The golden panda series boasts a yearly redesign. The 1/2 oz 1983 Chinese gold panda coin depicts a fully grown panda traversing a field of bamboo shoots on the reverse. The obverse of the coin is a promise of prosperity, being the ‘Hall of Abundant Harvests’ at the Beijing ‘Temple Of Heaven,’ as well as the legend reading: ‘People’s Republic Of China’ and the year of release. What better way to bring diversity to your collection than with a series that changes its look annually? Buy your beautiful 1/2 oz 1983 Chinese gold panda from our store today. This coin may be tarnished due to it's age. 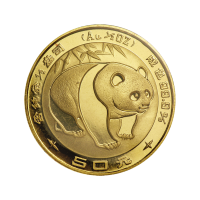 1/2 oz 1983 Chinese Panda Gold Coin When you buy a 1/2 oz 1983 Chinese gold panda from our shop today, you’ll enjoy the best price available online. These .999 fine gold 1/2 oz bullion coins come under seal from the People’s Bank Of China. Unlike most gold bullion coin series, The golden panda series boasts a yearly redesign. The 1/2 oz 1983 Chinese gold panda coin depicts a fully grown panda traversing a field of bamboo shoots on the reverse. The obverse of the coin is a promise of prosperity, being the ‘Hall of Abundant Harvests’ at the Beijing ‘Temple Of Heaven,’ as well as the legend reading: ‘People’s Republic Of China’ and the year of release. What better way to bring diversity to your collection than with a series that changes its look annually? Buy your beautiful 1/2 oz 1983 Chinese gold panda from our store today.